This week George Lucas announced that once again he is going to F*** with the Star Wars by converting all six films into 3-D. While some fans cheered at the news, its safe to say that most of us (including myself) just rolled our eyes at the possibility of Lucas messing with and changing scenes with new effects. 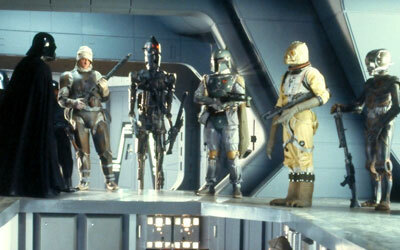 Perhaps this time Greedo will trip and accidentally shoot at Han? 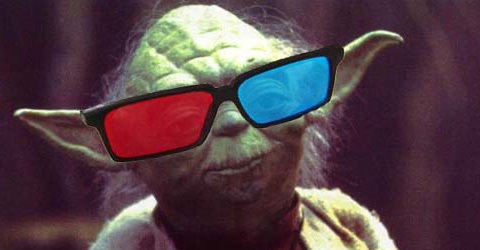 Personally, I think movies in 3-D is just another trend that will end soon. Lucas always seems to arrive late to the game with certain technology. It took years before he released the films on DVD. We still got another year before we will get the Blu-Ray versions. The Phantom Menace 3-D won’t arrive in theaters until 2012 followed with the release of one film per year in episode order. That means that we have to wait until 2018 before they are all released! I can’t deny that part of me is looking forward to seeing what the films will be like in 3-D. If it should be around until 2018, and done right, here are the Essential Seven Star Wars Scenes That Will Look Awesome in 3-D! A Star Wars fan filmed his girlfriend after watching Return of the Jedi. Apparently she cries at everything. I had the same reaction after I saw Jar Jar Binks in The Phantom Menace! Comments: Comments Off on The Ewoks are Sad!